“Two Glasses of Milk” by Teri Ellen Cross Davis from Haint (Gival Press, 2016). Reprinted by permission of Gival Press. *Note: The poem “Two Glasses of Milk” references Sylvia Plath’s suicide. On February 11, 1963, Plath placing her head in a gas oven. She left bread and milk for her two children, sleeping upstairs. like eel innards —you hate me for it. and that’s not all I need — you hate me for that too. swollen clouds, let the humid air suckle my skin. But for now, I shout through pursed and painted lips. I kick back with a dainty-slippered foot. I breech this birth. This time blonde, next brunette, I will come back. Again and again and again. * The Return of the Prodigal Mother is after paintings of the same name by the artist Dawn Black. “The Return of the Prodigal Mother” by Teri Ellen Cross Davis from Haint (Gival Press, 2016). Reprinted by permission of Gival Press. 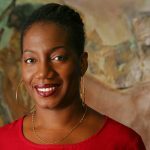 Teri Ellen Cross Davis is the author of Haint, winner of the a 2017 Ohioana Book Award in Poetry, a Cave Canem fellow and has received scholarships to attend the Virginia Center for Creative Arts and the Fine Arts Work Center in Provincetown.